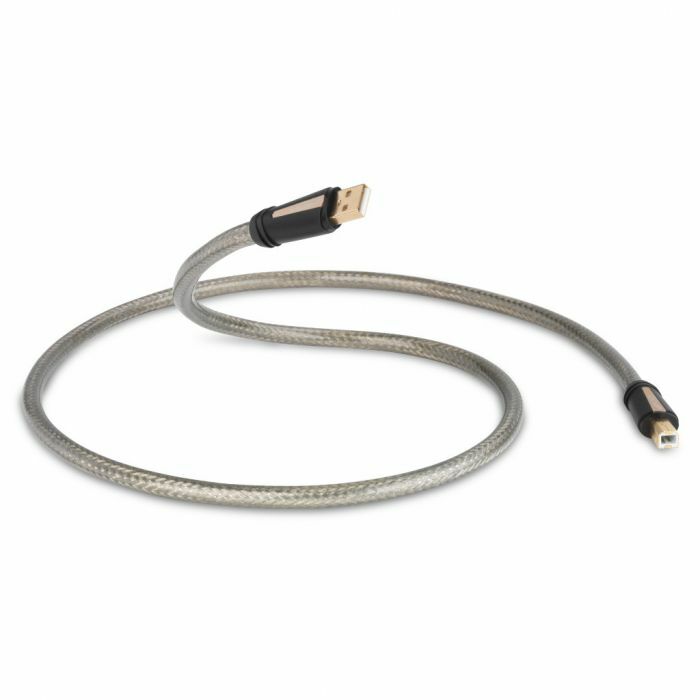 Reference USB cable is designed to transmit high definition digital audio between USB audio components (such as a computer or storage device and a high performance DAC) with ultra low jitter. It utilises a carefully engineered geometry including an integral Ferrite jacket, electrically isolated power conductors and an impedance controlled data lane to reduce timing errors within the digital signal, for cleaner audio transmission. QED Reference USB features an integral Zn/Mn floating ferrite jacket. When measured using an eye pattern generator at the correct data rate for high bandwidth USB, the cable exhibits 50% less jitter than competitor cables without the ferrite jacket. Our findings indicate that ultra low jitter in an isochronous data stream results in an audible improvement in sound quality. Certainly, in listening tests, the Reference cable with the ferrite jacket was preferred to samples without the jacket. Five nines oxygen free copper conductors, LDPE dielectrics and legendary build quality combine to create audible sonic improvements. Our extensive listening tests comparing competitor products at much higher price points have astonished us! We urge you to compare Reference USB not only to your current favourite cable but also alternative brands and models at any price! QED Reference USB uses a tightly controlled 24 AWG 99.999% OFC twisted pair which is bound by an aluminium mylar wrap with a drain wire pulled underneath. This arrangement is identical to that used in our high performance HDMI cables and is not usually found in a USB cable. Because the impedance of the data lane is kept strictly within defined limits, the jitter added to the data stream is kept to a minimum. Many audio enthusiasts feel that USB power cables carrying charging currents and PC power supply spikes near to the isochronous serial data stream can have an adverse affect on sound quality. One answer is to remove the power cables altogether but this deviates from the USB spec and can cause inconvenience especially if the DAC electronics require USB power. QED Reference data lanes are uniquely electrically isolated by using a double layer shield comprising a 100% aluminium mylar wrap and drain wire connected to ground.